Facebook and other tech companies aren't changing the racial mix or the percentage of women in their workforce fast enough, which has become a matter of concern to civil rights activists. Blacks, for example, accounted for 2 percent of Facebook's U.S. workforce as of May 31 this year, according to diversity data released by the company on Thursday. The corresponding figure for June last year was again 2 percent. The figure for Hispanics also remained at 4 percent of the U.S. workforce, while people of two or more races accounted for 3 percent. A positive but minute change was that the percentage of female employees increased from 31 percent in June 2014 to 32 percent in May 2015. The figures for participation by women are calculated by the company on a worldwide basis. The percentage of white staff fell from 57 percent to 55 percent while the percentage of Asian employees increased from 34 percent to 36 percent. Another tech giant, Google, said this month that the hiring of blacks and Hispanics outstripped the company's overall hiring growth, but these groups still make up just 2 percent and 3 percent of the company, respectively. Though 21 percent of its tech hires last year were women, their share of the tech workforce went up by only 1 percent. Moving percentage points takes a lot for a large company of 55,000 plus staff, said Google chief legal counsel David Drummond at the company's shareholder meeting, responding to remarks at the meeting from Rev. Jesse Jackson that companies had not moved the "needle on representation" very much. The civil rights leader has been demanding with considerable success that tech companies publish their diversity data. More than 25 companies released the data. Jackson now wants the companies to have tangible targets and to report on their success in meeting the goals. He holds that women and people of color represent underserved markets, underutilized talent and untapped capital for the companies. On Thursday, Jackson said in a statement that the 2015 numbers of Google, eBay and Facebook clearly demonstrate that more must be done as the numbers for tech and non-tech positions are virtually identical to 2014. "Tech companies must go beyond aspiring to do better, and set measurable goals targets and timetables to move the needle in diversity and inclusion. They must be intentional and accountable," he added. Facebook's Global Director of Diversity, Maxine Williams wrote in a post Thursday that the company had adopted an approach, akin to the Rooney Rule in the National Football League (NFL) in the U.S., which encourages "recruiters to look longer, harder and smarter for more diversity in the talent pool and ensures that hiring managers are exposed to a range of different candidates during the interview process." The Facebook University training program invites college freshmen, generally from underrepresented groups and with exceptional talent and interest in computer science, to spend time during summer to work on teams with Facebook mentors, so that they can learn the skills the company is looking for, Williams said. 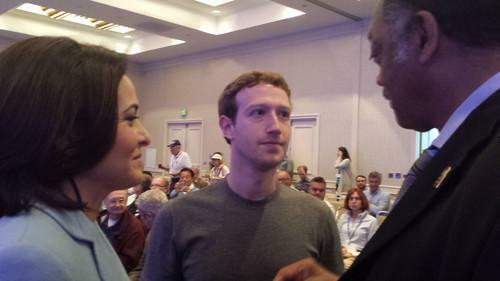 During a recent Facebook shareholder meeting, Jackson asked the company to partner with his RainbowPush civil rights organization to set up tech labs in 1,000 churches across the country, and make a major investment in the Oakland Unified School District, a public education school district, to build "a pipeline not just from India, but from surrounding Bay Area communities to Facebook and the tech industry," according to a transcript of the speech provided by RainbowPush.